The Indian Laburnum or Cassia fistula is a medium sized tree with lovely pendulous racemes of yellow flowers. The ones in our apartment complex have been blooming since the end of last year. Now only one tree still has her golden trusses on, and it is dropping fast. The rest of the trees have already produced bunches of long bean pods. 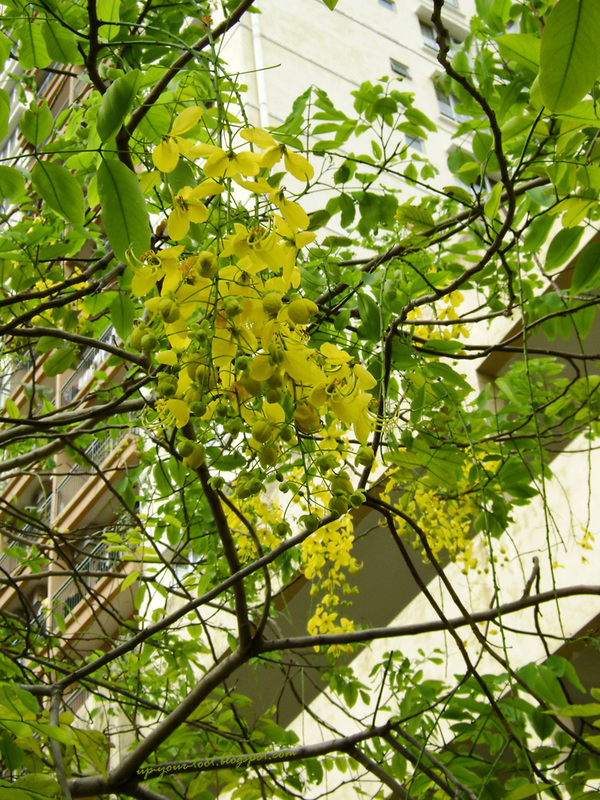 The pendulous yellow flowers of Cassia fistula, the Indian Laburnum tree. A native of southern Asia from India to Sri Lanka, it is now widespread throughout the tropics. Cassia fistula is naturally distributed in dry deciduous forest at lower altitudes. 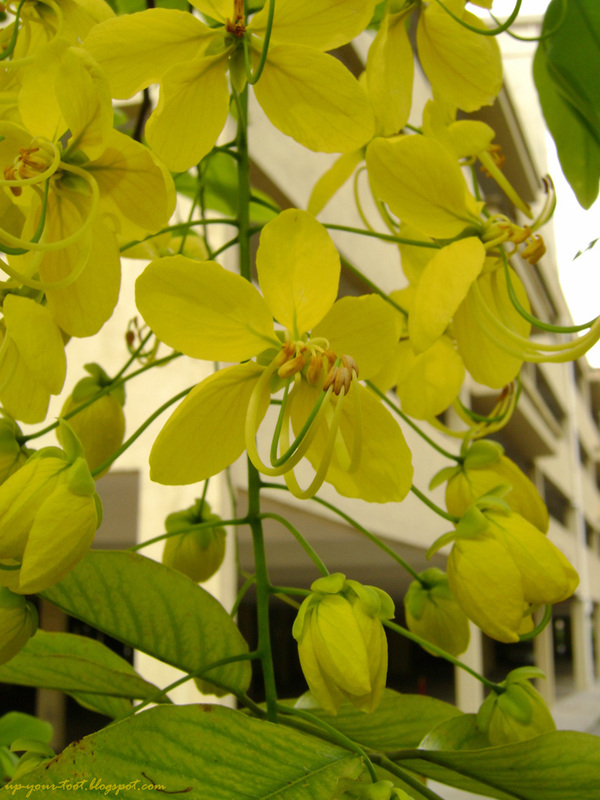 It is the state flower of the state of Kerala in India, called Kanikonna (where it is native) and is also the national flower emblem of Thailand, called Ratchaphruek. Many parts of this tree have been used in traditional medicine, especially in Ayurvedic medicine. The roots are known to have a very strong purgative effect, hence it is also known as purging Cassia. 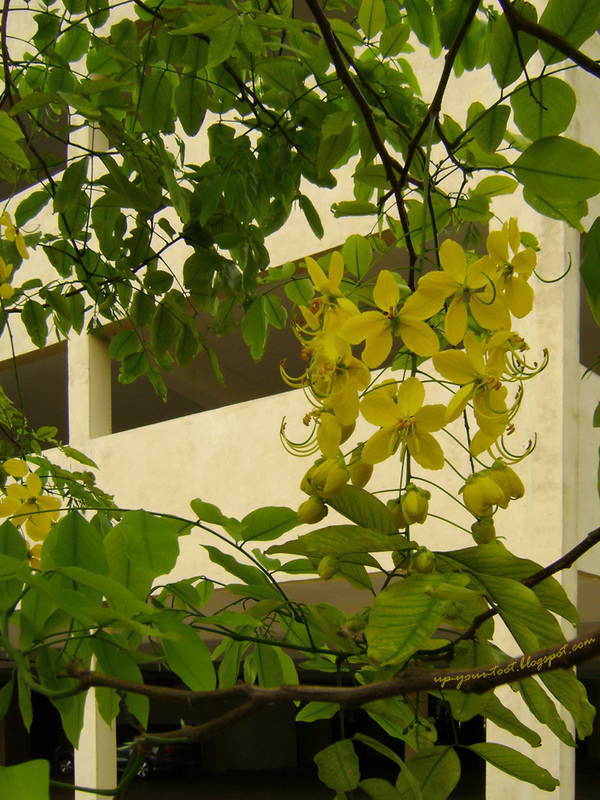 Hanging trusses of pretty Cassia fistula blooms. A close-up on the flower showing the stamens (yellow in colour with darker yellow anthers on the ends) and the pistil (green in colour). 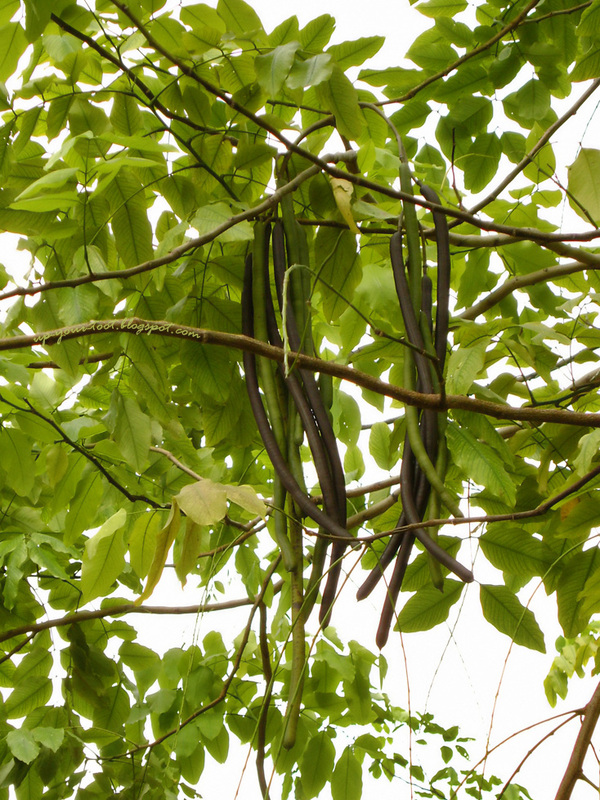 The seed pods look like yard-long beans on steroids - thicker and longer. They start off being green in colour and mature to a brownish black colour. In their native habitat, they usually commence blooming from March to May, and have an importance during the Vishu festival in April. However, the difference in the dry season over here and the changes in weather patterns had made the trees bloom very much earlier. I wonder when the trees will bloom again... Perhaps after another dry spell. Green and ripened pods of the Indian Laburnum tree. I always wondered what this plant name is. They are very pretty when in full bloom. As a kid, I've tasted the pulp of the fruit. Not at all interesting. Luckily I didn't bite into the seed, for it is poisonous. I think Autumn Belle has posted about this tree before somewhere in Klang. If in Shah Alam, UiTM has a whole row of them in the campus.